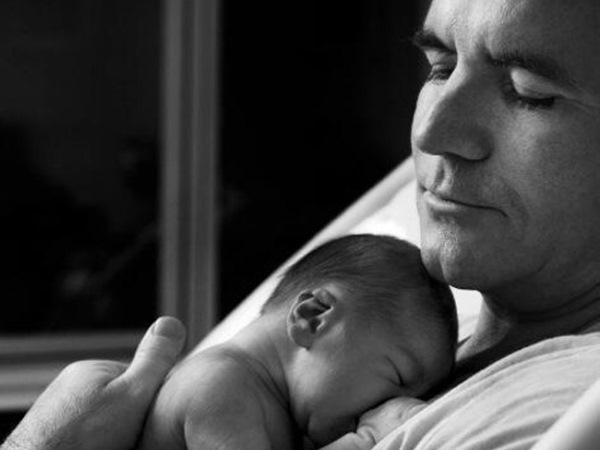 Simon Cowell has shared the first pictures of his newborn son, Eric, who was born on Valentine's Day. Simon Cowell has shared the first pictures of baby Eric. The reality TV mogul's girlfriend, Lauren Silverman, gave birth to their son on Friday and Simon has posted pictures of them doting over the tot. Alongside three black and white shots of the new parents with the baby - including one of Simon cradling him to his chest - he wrote on Twitter: "Mum, Dad and Eric. Now two days old. Now you can see how very handsome little Eric is. I never knew how much love and pride I would feel." Simon flew from London to New York on Friday as soon as he heard Lauren had gone into labour, and was by her side as his first son was born. He then visited the hospital again yesterday to see the newborn, arriving with a red bag, most likely filled with treats for Lauren. The X Factor boss Simon was very emotional after Eric's arrival, and said he was brought to "very happy tears" as he and Lauren welcomed their son into the world. A source said: "He is such a proud dad and they are completely obsessed. It was an incredible and emotional day for them both. "Simon was amazing and was by Lauren's side the entire time. There were very happy tears from everyone, including Simon."